In 1996 the State History Museum-Reserve of Novorossiysk celebrated its 80th anniversary. It was founded in 1916 at the initiative of the Vice-Governor of the province Chernomorye L.A. Sen’ko-Popovskiy as a Museum of Nature and History of the Black Sea coast in the Caucasus. The basis of its funds dated back to antiques, collected and stored in an town public library since 1894, and a collection on paleontology and geology of the first curator of the museum G.N. Sorokhtin. The inauguration of the exhibition was held in December 27, 1916 in a building bought on the donated funds of city citizens. 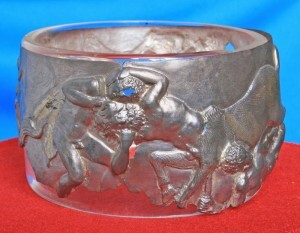 One of the rare survived artifacts of the time is a silver cup depicting a combat between the Greeks and centaurs found and got to the museum in the year of the inauguration. The museum had safely survived the hard times of the revolution and civil war. His guardian angel all these years was the same L.A. Sen’ko-Popovski, who, leaving the city with the White Army in 1920, left the residents “his beloved child ” and the museum collection in perfect order. After the establishment of the Soviet power in the museum new people came to work. From 1921 to 1930, the first keeper and then the head of the museum was G.F. Tchaikovsky, the author of many articles on the antiquities of Anapa and Novorossiysk. By the beginning of the Second World War the Museum had become the major scientific and educational institution. His fund had more than 7 thousand units and had excellent collections of geology and archeology. The collection was rich enough of the Circassian weapons. Among the authors of the collection of paintings there were the name of O.J. Kiprensky, I.K. Aivazovsky, A.N. Benoit, M.S. Saryan. The museum had a great scientific and historical library with 44,500 volumes. Unfortunately, almost all of this wealth had been lost during the war. Therefore, we can think that the museum collected its exhibits during the last 50 years. The main fund of the museum on 01.01.97, was 130 thousand exhibits. The archeology fund was ‒ 20 thousand units. Archaeological research in the area of Novorossiysk started in the last century. It was done by well-known experts of that time P.S. Uvarov, V.I. Sizov, E.D. Felitsyn. But these expeditions materials went to the central museums. Since the founding of the Museum of Novorossiysk systematic archaeological research was not carried out. Its funds were formed by further investigation of destroyed monuments, as well as by accidental chance finds, purchases or gifts. Apparently, one of these methods brought to the museum a collection of ancient coins of the famous before the revolution collector from Kerch I.A. Terletsky. The beginning of the formation of full-fledged archaeological fund as a result of the excavation dates to 1954, when under the leadership of Professor V.D. Blavatsky the Rayevsky fortified settlement was started. From 1955 to 1963 excavations was directed by N.A. Onaiko who for many years cooperated fruitfully with the Novorossiysk Museum. While working as a senior research specialist at the Institute of Archaeology of the USSR, Nadezhda Anisimovna Onaiko headed the Novorossiysk and Gelendzhik expeditions, she carried out the research and headed the expedition of the Institute, conducted research in this area and submitted the excavated materials to the museum. N.A. Onaiko discovered and partially excavated ancient settlements in the villages of Shirokaya Balka, Myskhako, Tsemdolina, Vladimirovka and adjacent cemeteries, a permanent participant of this research was A.V. Dmitriyev, the head of the Department of Archeology Museum, later he headed a number of expeditions, those materials formed a significant part of the archaeological funds. The most famous were the excavations of early medieval burial ground in the Dyurso valley, where more than 500 graves were excavated. It should be noted also a study of the medieval cemetery on Sapun Mount in 1985‒1986, the Rayevskaya ancient necropolis in the irrigation system in 1984‒1985, and the excavations at different sites in the Myskhako complex in 1990‒1993. In 1990‒1991 in Myskhako worked the North archeology Institute Caucasian expedition of IA RAS headed by A.N. Gay and E.I. Savchenko, explored the Chalcolithic settlement. In 1990 the work was resumed by the Novorossiysk RAS archeology Institute expedition under the leadership of A.A. Malyshev. The research was conducted in close collaboration with the Department of the Archeology Museum. During those years, the protective excavations were carried out on the necropolis Lobanova Schel (1990), in the necropolis in the Tsemdolina village (1991, 1995). ), the excavations of the ancient settlement and necropolis in Myskhako (1996). Contribution to the formation of the museum’s collection was contributed by local archaeologists and researchers: A.P. Kononenko, who excavated the burial of the Bronze Age in the Durso river estuary in 1974, the dolmen complex in the upper part of the Ozereyka river in 1986‒1987 and in the early medieval cemetery in the Tsemdolina “Ptitsefabrika” (1994). N.V. Fedorenko led the excavations of the medieval cemetery in Myskhako in 1991‒1992. A.V. Shishlov studied the antic necropolis in South Ozereyevka in 1995.